I’ve been trying to find a vegetarian burger recipe that works out. Preferably one that does not need to be fried. Frying a veggie burgers always leads to it’s falling apart. A patty made without processed this and that. No soy, tofu, or other contrived foods. My husband’s co-worker shared a a recipe for a quinoa-based, muffin-shaped, baked snack that I thought could be altered into a patty. And it kind of worked. But in the end, what I took from it was this: the trick to making (and baking) a good veggie burger patty is that you must include both 1-2 eggs and 1 egg white – it holds everything together while baking. Bake mushrooms and onion while some lentils simmer. Mix with herbs and eggs. Scoop onto a baking pan, and bake. Serve on buns with cheese and lettuce and dijon mustard like traditional burgers. Don’t pulse everything in the food processor. Be quick when making the patties – just a measuring scoopful onto the pan. In-and-out of the oven: don’t over bake. I’ve tried adding spices like cumin and coriander or mixed dried herbs, but I find these flavours over-take. 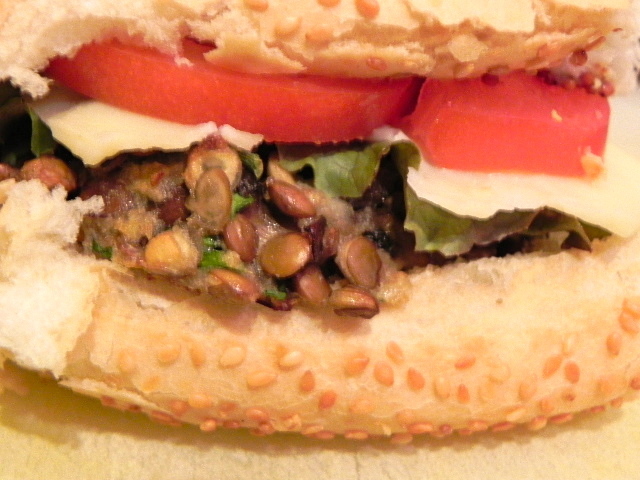 These patties taste of mushroom and lentil, and that leaves room for lots of flavourful toppings such as tomato, lettuce, and salsa verde. But you can add chopped nuts, or grated cheese or more veggies (like roasted zucchini) to the mix. These have all worked for me. Just don’t go overboard: there’s enough flavour here, plus the protein in the lentils and eggs to fill you up… sometimes simple is good. 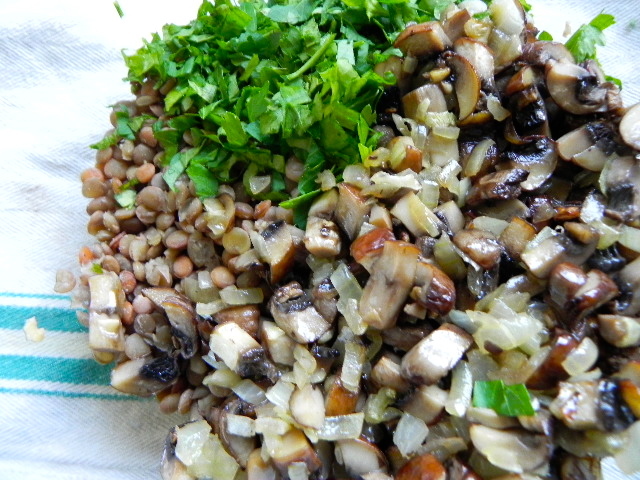 combine the (cooked) lentils, (baked) mushroom & onion, parsley & (beaten) eggs. mix gently. it will seem wet, but that’s ok.